A lot of people commenting on my blogposts and emailing me asking “How to apply as a factory worker in Korea?”. and although I am not authorized to hire people to work here in Korea, I feel obligated as a blogger to share the information on how people in the Philippines apply as a factory worker here. Interested applicant must go through the process of EPS or Employment Permit System. So here’s a guide for everyone out there who are interested to work in a manufacturing industry. This is based on the agreement between the Ministry of Employment and Labor of the Republic of Korea (MOEL) and the Department of Labor and Employment of the Philippines with regards to the MOU on the Sending of Workers. 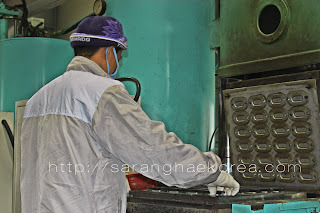 There are three rounds you must pass in order to be hired as Factory worker in South Korea. Every round has corresponding points, and the points that you will acquire along the way will help you open the door of opportunity to South Korea. So what are these three rounds? The announcement of EPS-TOPIK is usually posted in the POEA website (www.poea.gov.ph). There is no definite date of posting of announcement. While waiting for the announcement, I recommend you start learning Korean language. You need to pass the exam in order to be listed in the roster of applicants. Registration venues will soon be posted. Go to the respective testing venue on a specified date on the announcement and take the EPS-TOPIK exam. You must pass the exam, if not, you cannot work as a factory worker in Korea. The exam is consists of two types, the Listening and the Reading. There are 25 items for listening and 25 items also for reading. You must answer that in 70 minutes. Test type is multiple choice. You will be informed about the date of the announcement of test result. All you need to do is wait (usually about 7 days) for the announcement which can be found on POEA website. Once you see your name on the passer’s list, you can now submit the requirements to POEA. Please note that passing the exam does not guarantee employment, but basically, you are halfway there. The POEA will advice you to take the Skills test. Venue and date will be announced. The skills test will further measure your ability to speak and understand Korean Language. It's actually an interview using Korean as a medium of communication. In this test, you will also receive instructions in Korean and you must do what is asked by the interviewer to pass this test. Commands, like arranging things, identifying colors, lifting objects and whatnot, will be asked in Korean language and you must do it all perfectly. The employers in South Korea will choose the name in the roster based on the points gathered by the hopeful applicants. So it is important you have accumulated good amount of points every round. From the POEA website, you can also see the breakdown of the cost you need to pay for processing. In peso, it is approximately PHP35,000. That’s it. It’s not rocket science. You just need patience and the guts. For more information about working here in Korea in general, you may want to check my other posts regarding the current minimum wage for factory workers in Korea, type of jobs in manufacturing industry and a lot more HERE. hi, try to consult a doctor po sa mata and ask them advice if you are fit to work for manufacturing. Pwede naman po magsalamin dito kaya ok lang yan.. there's no harm in trying. Good day po! Ask ko lng po mahigpit po b s medical ang korea. Kc yung husband ko po. Gusto niya mag work korea but problem po kc cy s medical. May maliit po beklat s baga niya. Sa taiwan po kc unfit to work cy di daw po pwede yun s taiwan. Gnun din po b s korea. Salamat po. yes maam, strict po sila sa medical dito. sa mga ganyang cases, kelangan lang ng certification from the doctor na nagmedical sa kanya to state na hindi nakakahawa ang sakit nya. hai i'm eighteen years of age i just want to knw po if theres a korean language traning here in mindanao davao city like victorious corea? . because i'm so interested about work as factory worker in korea at itatanong ko lan din po if may training po ba bago ka mka pag trabaho sa factory diyan sa korea? Sir saang site po aq pdeng mag self study ng korean language? Ska my brokers fee at my byad dn po b dormitory ng f.worker jan sir ? I'm here in Thailand and i want to apply as factory worker in korea. How can i apply there? hello, you need to register to POEA. Unfortunately, there's no registration as of this moment. Wait for their announcement. WHEN? We don't know. good day po.. ex-ofw po ako from south korea as a factory worker, from nov.2005-dec.2011-finished contract. ask ko lang po kung pwede pa akong magtrabaho even if i'm 44 years old? thank you so much po. If you will apply po ulit via EPS, hindi na po pwede kasi hanggang 38 lang po.. pero kung isincere po kayo ng dati nyong amo, i guess it's possible. the best you can do is to contact your previous employer. yes po..hindi naman hinahanapan ng transcript of records.. as long as you're 18 years old and above. good pm po, may tanong lang po ako regarding dun sa website ng poea. nakalimutan ko na po kasi yung password and username ko kaya lang ang website mismo hindi nag re respond sa email para e retrieve po yong account. anu po ba ang dapat gawin dahil nga po first step yung registration dba? salamat!!! wala pong password recovery ang POEA website.. Kung meron man eh hindi gumagana po yon. Kelangan nyo po talaga icontact ang POEA so they can manually retrieve your password. If not, they can advice you to make a new account maybe. Anyeonghaseyo.. True po ba na pag nag skill test ay mas malaki ang chance na magka employer kagad? What if hindi po mag skill test. how long po to wait, thanks. nope,not true. Kasi may mga hindi nagtake ng skill test pero napaaga naman alis nila. ask lang po if how many years bago ka uli makapag apply sa korea if nag tnt ka na sa korea then nag surrender..
helloo..meron pa kya slot as factory worker?naa mn gd ko dre hk nd sat pa uwi ko pinas..pwd d i mag self study lng sa korean langguage?then go exan diretso? hi po.. nakalista na po from first step to sixth step ang process ng pag aaply. You have to go home po and register and take the exam. Now, if nakpasa mo kayo at nailist na po kau sa roster, you can go back to hoingkong while waiting. May date na ba for exam? I am really interested to work abroad. as of now, wala pa po. you have to check out POEA website often po. anu, anu po ung asa exam? KOrean language po ba? you just need to answer a questionnaire po na ipopost ng POEA. as of now wala pa pong survey so abang mode muna po kayo. NO!!! Certificate of training in learning korean language is definitely not required kasi ako nakapagtake ng exam without certificate. is it okey kht wlng experience yet, as factory worker? yep. experience is not required. Hi po. Im interested in working as a factory worker in korea, im willing to undergo language training but i have doubts because ill be turning 37 next month, at my age, is it still possible for me to find an employer in korea at age 37? I dont want to put into waste the money ill spend in learning korean language. Hope you can give me your opinion on this. Thank you. kung early po sila makapagpaexam ng KLT 13 this year, pwede pa po yan. Ang problema po kasi kung late na or next year pa, baka hindi nyo na po mahabol. Hello po, im from davao. May nakita po ako post from VISMIN KOREAN LANGUAGE CENTER tungkol sa job hiring ng factory worker govt to govt. Orientation po nila mamaya, should I attend po, any idea about the orientation? Sir saang site po aq pdeng mag self study ng korean language. My brokers fee po ba jan ska my byad po ba ang dormitory ng mga f.worker jan? Translation lng po b nid pag aralan sir o pti mgsulat at mgbasa ng korean? Meron po ba ibang work sa korea na di na kylangan matuto mgkorean language? Hi po. Thanks sa info. marami pa po time to study. Saang area ka ba? Sir sa x-ray ko po kasi meron po findings na mild scoliosis. tumatangap po b cla sa Korea ng merung mild scollio factory po sna ang aaplyan ko. as long as hindi po sya contagious ok naman po. at saka may medical naman sa pinas, sila ang nakakaalam kung pasok ba o hindi. hello po, ask lng po...qualified po ba ang nag undergone ng cesarian operation? Hi sir, thanks for making this blog. It helps a lot. I just want to ask for an opinion po. There will be an orientation this coming Monday. The name of the agency is Victorious Corea. I have plans of skipping my work on that day just to give it a try. What do you think po? Yes, go attend. Sometimes you need to risk to follow your dreams. Please tell me kung anong sinabi sa orientation. Hi sir tanong ko lang ganu po katagal usually ang inaabot mula po sa exam hangang sa makaalis.. My 1 year po ba? Thank you po..
depende yan maam kung maselect ka agad. May iba after one month alis na, yong iba naman inabot pa ng two years bago naselect. In my case, inabot ako ng 8 months bago nakaalis. In short, depende talaga sa swerte mo kung mapili ka agad agad. afternoon .. kailan po yung last exam sa poea? kasi sinabihan sa orientation na yung last exam daw ay yung april 2015 ?? totoo ba yun ??? yes po. last april lang ang exam and the result will be released this month. 12th batch na yong nag exam last april. i just want to ask po kung pwede broken sched ang pag tra-training? and ilang months po kaya aabutin ang training kasi currently employed p po ako just in case makapasa sa exam. thanks. no training required. Just like you, I self studied korean language kasi I was also working before. The training that will be conducted by POEA is the only required training which will only happen if you have already selected. Pero kung balak mo mag exam, ikaw na bahala sa diskarte mo on how to learn the language. Interasado ako mg.apply basta sa korea. Ano po ba ang job hiring sa korea ngayon.? Fresh graduate po aq ng computer engineering. Thanks po. Factory workers po ang mostly hinahanap dito. And a bachelor's degree is not required to apply for that kind of job. victorious language learning center po panglan . Hi . regarding po ba sa medical may weight limit po ba at height requirement? no weight, no height.. it doesn't matter po. Pero sa actual selection, nakalagay sa data nyo ang height and weight... it's up to the company owners kung icoconsider ba nila ang height and weight. Last question po.. Ung sa dental po mahigpit po rin bah? wala pa po schedule.. abang abang lang po sa announcement. Habang nag aantay po ko ng sched ng exam, dapt aral lang ng aral? Gnun po ba? Meaning kahit mag enroll po ko ngayon sa language center, ala pa po guarantee ng date ng exam? wala po kasing schedule ang exam sir. so you just have to wait kung kelan ang announcement of exam. From exam naman hanggang pag alis, aabutin din mo ng mga 1 year yan, maswerte na kung mapili ka ng mas early kasi makakaalis ka in months time. Hi po magkano po usualy ang estimatesalary ng factory worker sa korea? And lagi po ba free accomodation? accomodation is free. Salary is minimum mga 40k. wala po ganun sir. You have to check POEA website para mainform.. or read ng news and info. Hi po.ask lmg po if mag take k ng exam..mga basic questions lang po ba? ok lang po ang vocational sir. Depende din po sa mapupuntahan nyong trabaho, may trabahong mahirap, mayron ding madali..
hi po good day,, ask ko lang po how much mababayaran once nag_aral ng korean language? For VISMIN, I guess it's fair price, pero para sa akin mahal na kasi yan eh.. haha.. I just self studied noon... may Youtube naman at Google..
is Korea strict when it comes to age? YES.. they are strict in everything. Ok lng po vah mgapply kht no experience po sa factory? im interested po san po ang add.at mga requirements for the 1step. yong first step po is to take a survey na ipopost ng poea sa website nila which is poea.gov.ph... apparently, wala pa pong schedule kaya wala pa pong survey. Kailan po ang next exam? Thank you. Good Day po isa rin po ako sa intresado mag work sa korea im 25 years old graduate po ako 4 years course in college , taga davao po ako . magtatanong lang po sana ako if ok lang po ba mag apply kahit may operasyon ako sa tyan pero 8 years ago na po ito naga climb po ako at the present at nag tatrabaho po ako homebased at gusto ko lang po sana malaman if pwede po ba ako sa trabaho na yan kasi intresado po ako. as long as kaya nyo na pong makapagtrabaho ng mabigat, wala pong problema yan. hi ,parehas lang po ba ang schedule ng female at male for the exam? Tanong ko lang po. 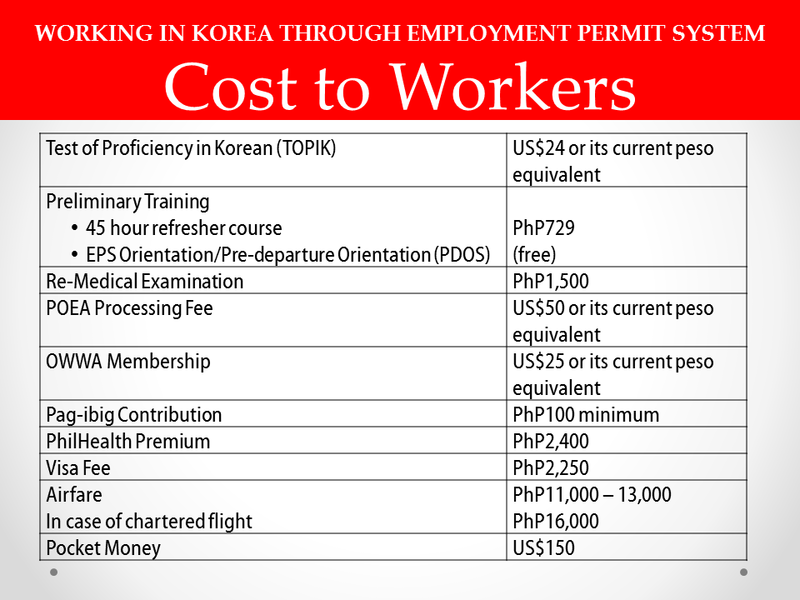 Kung halimbawa nasahod po tayo ng 70k sa pagwowork sa korea. Magakano naman po ang expensive sa pagkain or sa ibang bagay. Baka po kasi malaki nga ang sahod tapos mahal nmn ang bilihin sa korea. living expenses in Korea is expensive talaga po. kelangan lang talaga amg tipid.. usually naman free ang boarding and food sa mga factory workers dito kaya hindi masyadong magastos sa food. Sir, Gandang hapon. Tanung ko lang kung ano pinag kaiba nang Close question bank at open question? Dyan daw kase kukunin mga question sa klt exam. ANGLIONGTO ST. DIHO,BUHANGIN, DAVAO CITY. Diversion Road location namin . Ok :) thanks sa reply! good day.. saranghae korea ask lng po may ate po ako s south korea na nkpag aswa ng korean ska nkpnta n po ako 2 times na kso andto n ko s pinas gs2 ko sna mag work as factory worker pde po bang ndi na mag take ng exam may iba pa po bang paraan tnx god bless..
hello jhaycel, I am sorry but that is not possible. Kung halimbwa sponsor ka ng ate mo na pumunta dito, limited lang din ang time na pagstay mo. If you will work here, that means you need to extend beyond the time na allowed ka which means TNT ka na. The only way to work as factory worker is to go through POEA as stated in this article. Bro ty sa blog mo it helps a lot. Gusto ko din makapapunta at magwork dyan. Nandyan din kasi asawa ko, kaya lang on the rocks kami ngyon dahil tata sa lifestyle dyan. Mahilig sila sa nightlife specially sat night no work tommorow. May anak kami usapan namin ako muna bahala sa anak namin sya muna dyan invite sya ng kapatid nya may asawang koreano. Nagwowork sya kahit visit visa lang hawak nya. Help bro I need it badly.. I'm totally down. I will do anything for the sake of my family specially my son. Gusto ko sya sundan dyan. Pm bro para sa mas mabilis na info at proseso. Pede ba kita makausap pm? Hello sir Ergie, napakasalimuot naman ng pinagdadaanan nyo po ngaun. I will tell you straight, hindi po madali mag apply as factory worker dito sa korea. Una sa lahat ipasa nyo muna ang exam at sa ngayon po wala pa pong schedule for hiring. So maybe aabutin pa ng 2 years including yong paghihintay nyo bago kayo makapunta dito. The best thing that you can do now is COMMUNICATION. Kelangan nyo po makausap asawa nyo through skype or facebook tungkol dito. Mahirap po ang LDR pero kung may constant communication kayo sa isa't isa I am sure mapag uusapan nyo naman po yan. Hindi po guaranteed na masosolve ang problem nyo kung pupuntahn mo sya dito. Find ways to reach to her, baka lang din kasi masyado ka rin lang nag iisip. You need to get her side. May alam ka ba kung hanggang ilan taon lang pwede mag stay ang invite na kapatid diyan? Pre, katulad lang ba dito pag process ng medical examination sa pinas or iba na, I mean kung kunting test nalang gagawin sayo? Kasi sabi nila mag reretake ka ulit ng medical pagkatungtong mo dyan sa korea. yes sir. pero mabilisan na dito, hindi kasing meticulous sa pinas. pagdating sa training center, medical kayo kaagad kaya impotanteng huwag uminom ng kahit anong gamot bago ang flight. that's a good start bro. Pero ilang taon ka na ba? Kasi hanggang 38 years old lang pwede dito eh. Wala pang announcement for KLT 13, kakatapos lang din kasi ng exam for KLT 12, so abang abang ka lang, habang nag aabang, aral ka lang para siguradong mapasa mo ang exam. Good luck sa iyo at sana ay maayos ang inyong sitwasyon ng pamilya mo. 31 na ako ngayon bro. May chance pa ba ma-qualified sa next epsklt exam? hindi nman magmamatter kung ano pipiliin mo dun sa ereg. just select any kasi hindi naman yan titingnan ng employer, para lang yan sa record ng POEA. Busyatom will just help you learn the basic bro. Mas maganda pa rin pgpractisan mo yong actual reviewer ng poea. Ahh, ganun ba pre. Di naman sila strict sa body diba? hindi naman. Urine, blood at xray test lang naman. Ahh! Akala ko ganun pa rin. Nag send ako ng medical result thru LBC, sure ba yun na matatanggap agad sir? Baka kasi paulitin na naman ako sa simula. May data na ako sir. ^_^ Waiting nalang EPI. Nice... God Bless sir... sana may makapag select na iyo agad. Madami pre. Pwede yan download mo lahat ng textbook by parts 1 - 50 yun eh. Tapos sa Youtube search mo VIVI KOREAN or SEEMILE, panoorin mo o idownload mga videos nila. Google mo rin ibang site para dagdag kaalaman. Madali lang yan pre pag motivated ka at desidido ka talagang mapasa mo ang EPS. Vocabulary, numbers, writing hangul, alphabet, creating a sentence, greetings. At ito pa ang dapat mong malaman, may ways sila sa pag uusap sa bata, ka e-dad mo lang at mas matanda sayo. Lahat yan pag-aaralan mo. Anyway, i would just like to ask more information about this industry? For example, nahired ako, usually how many months will be the contract? Coz right now i am waiting for the next EPS ToPik and i will be taking that test as soon as possible. :) im 19 years old. :) but i am planning to go back here in philippines on june or july 2016 again because i will be continuing my studies. as of this year, i want to work in korea, if i got hired, usually how many months will be the contract? Hi kenne. Contracts usually last up to 3 years. You can't just work for few months and go home. If you want to work here in korea, give it at least a year if you want to stop and go back home. And few months of working here will not earn you that much money. It's not worth the time and effort of applying, sayang ang chance. matatanggap po ba kahit walang working experience ? Hello, nice topic and info from the whole blog site, for aspiring Filipinos want to get a job in S. Korea thru EPS-TOPIK. I'm 25, currently 3 years na design engineer here in Bataan. Nakaka-inspire yung self review nyo then you've passed the exams. Hoping to do that too, kasi mejo kamahalan yung P7k sa mga training center then dyahe pa if may current na job pa. Hoping to be in the 13th batch. you can do it sir. If you really want this opportunity, you will do everything even the impossible. may possibility, kasi random ang pagselect..pero that possibility is so small and you have no right to select employer. sir ask ko lng po if nd bawal ang may tattoo kng mag aply ng factory worker sa korea? Hi po sir.pwede po bang mgtrabaho sa korea kahit may mild destroscoliosis ako as factory worker?hindi po ba sila mahigpit sa medical?lalo kng may case po ako na ganun?.balak ko po kasi mag-aral ng korean language.kaya lang natatakot naman po ako baka hindi nla tanggapin ang may mild scoliosis. hi merry rose, before ka makapag apply sa korea, may physical and medical exam na po sa Pilipinas. I suggest you better check with POEA approved hospitals and medical centers dyan sa Pinas kung pwede ba makapag trabaho abroad (not only Korea) ang mga may ganyang sakit. Sila ang mas nakakaalam kasi alam nila ang standard ng medical test sa abroad. hi po,ask ko lng po if may posibility na matanggap ako sa korea kasi may type 2 diabetes po ako. Hi anamae, wala akong kakilalang may ganayang case pero sa medical test kasi kasali ang blood test. I am sure malalaman na may diabetes ka. Ang hindi ko lang sure if fit to work pa rin ba or hindi pag may ganyan. Pero suggestion ko, check mo muna sa mga POEA accredited medical centers na malapit sa inyo and ask. They know the standards of medical test in working abroad, so they can answer you better. Sir, mag kano po magagastos sa lahat ng requirements? Thanks po in advance. yes, medical, physical and even mental. Naghubad pa kami sa harap ng doktor. Sir ask qu lang po, f ever na nkapasa na po sa EPS TOPIC exam. Then ilang months po antayin bago maselect ng company then ilang months po antayin bago mkaalis ngbansa. Abutin po ba ng years un? yes po.. aabutin po ng years yan po.. walang specific numbers kung ilang months or years, basta matagal po.. maswerte na po kung after three months maseselect ka. hi po,ano po bang klase ng test ang ginagawa sa dugo kpag medical na. bukod po sa fbs may Hemoglobin A1c Test din po ba ? or tinitignan lng po nila kung mataas ang blood sugar at kung may hepa at hiv? ano po ung nakapos sa website ng poea ngayun? pwede po ba yun sa mga first time na kukuha ng exam or para lng po sa mga galing na ng korea? good day sir ask ko lang po if you failed the exam pede ka po ba ulit mag retake? yes. you can always retake. mahahaba po ba ang mga tanong sa topik exam? sana po nabasa nyo sa article na this is a gvernment to govenment agreement. You should only apply sa POEA..so obviously, sa POEA po kayo pupunta at hindi sa kung saan saang office.. baka ma scam pa kayo maam mahirap na. depende po yan sa magiigng amo mo po. Kasi dapat ang bakasyon is after one year pa.. kung halimbawa less than a year pa lang nangari na ang ganyan, pwede mo pakiusapan boss mo.. nasa kanya na kung papayagan ka o hindi. GUD DAY PO,ask ko lng po if na uunfit ba sa medical ang may mild fatty liver? ayos lang yan. experience is not a must.. pasok naman ang age mo sa bracket. I hope po nabasa nyo po ang article na ito before you commented. Nandjan na po ang procedure from step 1 up to end. For now, wala pa pong hiring. ako din may spot po ako dati sa likod,pero ng maintain akong gamot good for 6months,at my nakuha akong certificate n nag galing sa hospital,pwde po ba ako mag apply? kung may clearance certificate na po wala na pong problema dyan. hello po sir ,itatanong ko lang po sana after po mkpagregister sa poea ,ano na po ang next? wait, wait and wait. Wala pa po hiring sir, so wait lang po kayo ng announcement ng POEA kung hiring na ang Korea. Please read the article po, nandyan po lahat ng procedure. That labor contract is the contract you signed during the orientation. Dun po nakasaad yong company name at saka yong salary...etc... ibig sbihin naipasa na po ang contract na pinirmahan mo. Thanks po sa quick reply. I thought they will send me a soft copy that I can download. So that means po makikita ko yung contract sa POEA once I will visit there for contract signing? By the way, pwede na po ba kong pumunta dun anytime? inquire lng po want q mag work in south korea but the problem is andito po aq sa uae paano po b mag apply? tnx..